There is something sublime about Clint Eastwood's Gran Torino. Maybe it's seeing Eastwood return in front of the camera for a role that goes beyond our meager expectations into more nuanced territory. Or it might be how the film recalls much of his career in some surprising ways that perfectly sum up Eastwood's outlook on life and his career. Either way, Gran Torino is a beautiful Christmas gift from a prolific filmmaker (it's his second film in 3 months) that will prove to be one of the more important benchmarks in his filmography as both an actor and director. Eastwood plays Walt Kowalski, retired, a recent widower, veteran of the Korean War. All indications at the start of the movie are that only his late wife understood him. He is alienated from his two sons and their families. A young priest, Father Janovich (Christopher Carley) is the only one reaching out to him, and that only because of a deathbed promise to Kowalski's wife. Kowalski, an apparently stereotypical "cranky old man", rebuffs him, preferring to rail against the decline of our country, wallowing in his racism, seething at his neighborhood's ghettoization by the influx of Hmong "barbarians". The one thing that seems to inspire pride in Kowalski is a 1972 mint-condition Ford Gran Torino. When Thao (Bee Vang), the Hmong boy next door, attempts to steal it as part of a gang initiation, this sets off a series of events that lead Kowalski to reexamine his hardened attitudes. Eastwood smartly dances around his tough-guy image to lure us into Torino's story. When he finds Thao breaking in, he corners the boy with his shotgun aimed squarely at him. Confronting the hopeless gang, who are so determined to prove to Thao that he has little chance of escaping his neighborhood that they'll kill to have him join the gang, Kowalski tells them that in Korea he used to stack up bodies of guys like them; use them as sandbags. You can be forgiven for expecting some Dirty Harry-type heroics at this point, except that Eastwood is smarter than that. Kowalski is lonely, seeking human contact, which he finds from Thao's sister, Sue (Ahney Her), a precocious teen who sees through his gruffness. In fact, an unspoken reason he connects with Sue is a repeated tendency to be more demanding of males than females, so you could add a bit of reverse-sexism to his list of faults. In a sense, Kowalski sees himself in many of the young males in this movie, and either finds them weak and wanting, as he does Thao and Father Janovich, or he punishes them when he sees his own failings magnified and manifested in them, as he does in the Hmong gang members. After the gang strikes out against his neighbors, Kowalski is unexpectedly cautious for an Eastwood character, waiting for his anger to subside in order to think clearly in calculating the correct degree of retaliation. Like in some of his earlier films, Eastwood explores the pitfalls of using violence to resolve conflicts. He again approaches it through the conduit of a violent man who stands in sharp relief to the weaker folks he must defend. Like Unforgiven's William Munny, Walt Kowalski is haunted by his killing in the past. Like Butch (Kevin Costner) in A Perfect World (1993), Kowalski is conscious of protecting the innocent from harm. And like Jimmy (Sean Penn) in Mystic River (2003), Harry Callahan, and any number of protagonists in Eastwood's films, Kowalski is not above taking matters into his own hands to avenge those in his care. The difference is that Kowalski and Eastwood are older, wiser, nearer to the end of their lives. They realize the consequences both moral and societal of committing murder. Eastwood plays on our expectations surrounding his vigilante persona, and inverts the outcome of the film to great effect. Gran Torino is an elegy to the gun-toting avenger of Eastwood's past, an exorcism of a persona that, at nearly 80 years of age, marks a rebirth for the actor-director. Gran Torino is in limited release, and opens across the country on January 9th. Interesting review. I'm actually working on a review of this at the moment, but from the opposite point of view. I really didn't like the film at all. For die hard Eastwood people, it's connections with Dirty Harry will no doubt please, but I found it to be out of touch and sloppy from start to finish. I'll leave it at that and keep working on my review! I'm always glad to hear other points of view along the way though to see why it works for some people...it just didn't work for me at all. The "sloppy" part really surprises me. I usually find Eastwood's films to have glaring structural problems, Changeling and Mystic River come to mind. I found this movie to be neat and tidy, almost going right up to the edge of being too pat. And it fulfilled a film proverb attributed to Hawks: "A good movie is three good scenes and no bad scenes." Still, I'm really looking forward to your review James. But as I surf through the internets reading reviews of "Gran Torino," I'm most astonished that no one holds Eastwood accountable for the number of scenes that play on-the-nose, awkwardly and flat. Then again, Eastwood demonstrated the same in the latter half of "Million Dollar Baby" and got a pass -- but at the time, I thought that was because critics were being overly cautious to guard the plot's big secret. And "Flags Of Our Fathers" has similar issues. 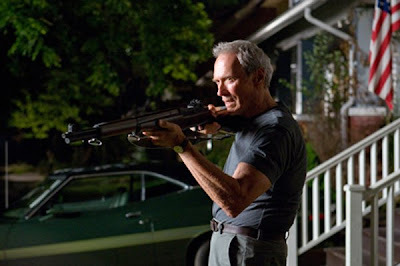 Yes, there are moments in "Gran Torino" when Eastwood's charm wins out. Or when Vang and Her somehow manage to make some atrocious dialogue seem respectable. But look at nothing else except the depictions of the gang bangers, and tell me if it reminds you of great cinema or of an after-school special. If "Gran Torino" is a great film -- and you're hardly the only one saying so -- it reaches that status in spite of driving on three blown tires. There are lots of bad scenes in "Gran Torino." Too many to count. Hi James and welcome to the site. I appreciate the point of view you discuss in your own review (well-written by the way) even if I don't necessarily agree with it. Gran Torino is a character study with Walt Kowalski as its subject. Much of it is seen subjectively from his p.o.v. (the only scenes he is not in are scenes where we need a vital piece of information to advance the plot, such as the one where Thao gets beat up, and as such Eastwood is guilty of cheating). I find the movie's tone and style to be perfectly in line with the blunt, racist Kowalski who is at the heart of it. So yes, the "gang bangers" on the corner are stereotypical. But I find it to be appropriate within the protagonist's narrow world view. I've seen enough Eastwood films to know that he is not a racist (Bird, True Life), nor is he ignorant of complexity in story situations (often times allowing it to overwhelm his thesis; Mystic River, Changeling). He is following an artistic directive in the way he chose to fashion this movie.